Wargrave Local History Society's March meeting began with the AGM, when the past year was reviewed, the coming year's committee elected, and details of the 2015-16 programme given. Following the formal part of the meeting, two videos about the dedication of the memorial to the Flying Fortress aircrew were shown, followed by two slide presentations by Philip Smith on Wargrave Tennis Club and local ballet pupils at the Village Festival in 2011. 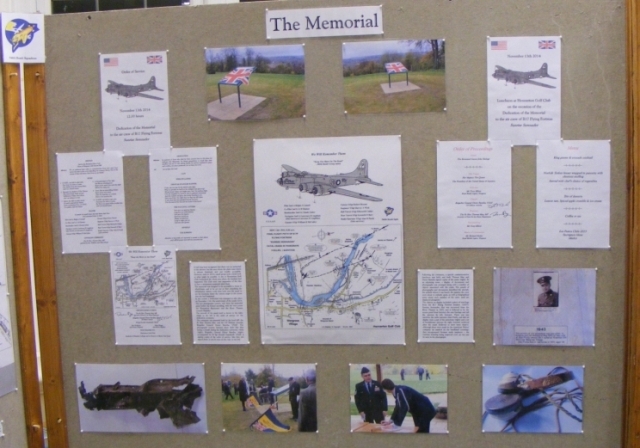 A separate page is devoted to a description of the Flying Fortress crash memorial dedication, and the display boards provided by the Society to illustrate the event were also on display in the side room of the Pavilion - an example of these is shown here. The next meeting will be on Tuesday April 14th when we will welcome Dr Phillada Ballard to speak about Culham Court, and then on Tuesday May 12, Sheila Viner, a member of the Mills Archive Trust, will give a talk on Water Mills on the Thames and Loddon.